We're just a few months in on 2015 but chances are if you love to travel and see the world, you've probably already booked that week's holiday you look forward to every year. Jet lag is a feeling of drowsiness and lethargy experienced after a long aircraft journey. Your body clock controls your sleeping and waking pattern and is set to your local time so that you are hungry in the morning and sleepy in the evening. 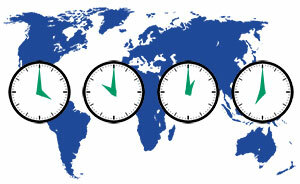 When travelling across time zones, it can take some time for your body clock to adjust to a new daily routine. Jet lag is now such an issue among long haul fliers that British Airways have decided to put together a Jet Lag Advisor in an attempt to combat the problem. Whilst it's difficult to actually beat jet lag once it has taken hold there are measures you can take to the lessen the effects. Stick to these 5 golden rules and you won’t go wrong. Establish A New Daily Routine. Embrace the new. Eat and sleep at the times people do in the country you are flying to, not at the time you usually eat and sleep at home. Plan A Stopover. If possible try to have a stopover on your journey to allow your body to adjust gradually to the new time zone. Plus a change of scenery always breaks up the monotony of a long flight. Have A Drink. But lay off the alcohol. Make sure you're well hydrated before flying and drink plenty of fluid during your flight. Medicate Wisely. Taking sleeping tablets is not advised, as it won't help your body adjust naturally to new sleeping patterns. Keep Calm And Carry On. Stress only makes jet lag worse. So the little things like pre-booking parking in advance and checking in online will only keep stress levels down.